In the two video clips below Tom Green, personal trainer; A three year assistant college coach responsible for 35 NAIA All Americans, 11 NAIA National Champions and 10 collegiate record holders, demonstrates exercises to build strength in runners. In the first video Coach Green shows three mini-band exercises that engage the core and develop strength in this all important area. The drill begins with a mini-band around the ankle of the athlete. The athlete will move laterally 10 steps to the right and then 10 steps to the left. It is important that the athlete move in a manner that keeps tension in the mini-band the entire time. While moving laterally the athlete will use a second band, holding one end in each hand. The athlete will extend her arms in front at chest height and pulse the band as she moves to the side. In the next drill the athlete will move forward 10 steps and then backward 10 steps. This time the athlete will hold her second band above her head and pulse the band will moving forward and back. In the final drill the athlete will perform a carioca with mini-bands around the ankle and the arms pulsing a second band held in front at chest height. It is important on the carioca step to limit the rotation of the lower back and attempt to keep the rotation in the hips. In the second video Coach Green explains three simple but excellent exercises for runners. He offers explanations of why and how for the hip thrust, front and side plank series, and the bird dog exercise. 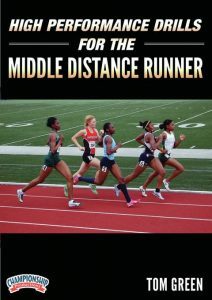 These clips are taken from Coach Green’s instructional video High Performance Drills for the Middle Distance Runner. For more information about that DVD click the link above. Both of the YouTube videos below have audio, so please make sure that your sound is turned on and that you can access the site. Some schools block access to YouTube.